That's the title of one of the chapters in Du rêve pour les oufs that I'm translating for my thesis. 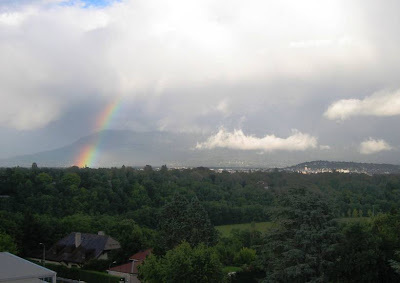 It means "the rainbow after weeks of rain", and I took a picture this afternoon that sums it up quite nicely. The Fourth of July celebration got rained out, though... bummer. I guess this means that I will just have to create some new traditions this year and celebrate the Swiss national holiday in August. I found cute, cheap nail polish in the store today, and now I have copper toes and silver sparkly fingers. Nothing like new nail polish to make a girl happy.